High School Graduation in New York City: Is Neighborhood Still Destiny? 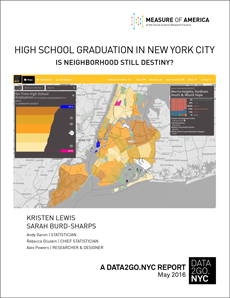 is an in-depth look at disparities in on-time high school graduation rates by New York City neighborhood. 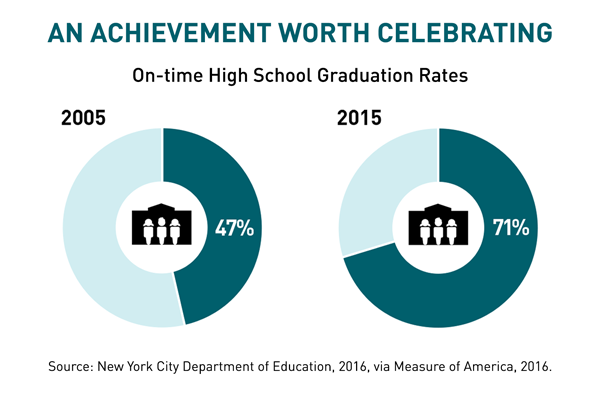 High School Graduation in New York City contributes to the ongoing discussion around high school quality, outcomes, and choice in the City by presenting the on-time graduation rates for high school students not by the schools they attend, since those data are already available, but rather by the neighborhoods they call home. 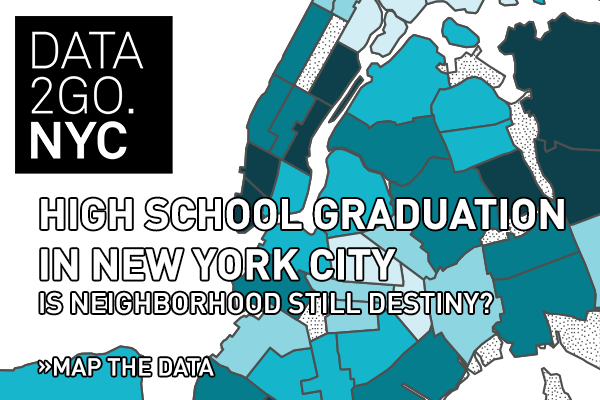 The findings in this DATA2GO.NYC report raise important questions: How successful is the universal high school choice policy in weakening the well-known link between the conditions in students neighborhoods and their educational outcomes? Do the benefits of the current system outweigh its costs to students and families? How might it work better? 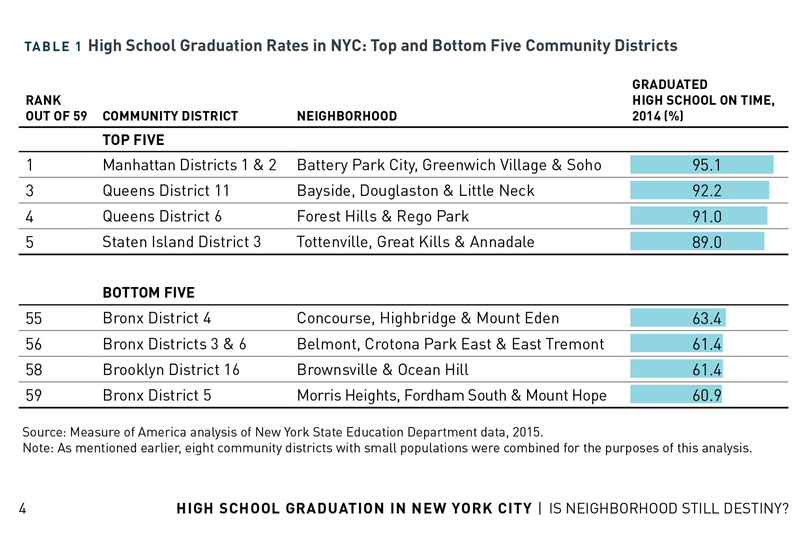 More than 95 percent of students in Manhattan Community Districts 1 and 2, which include Battery Park City, Greenwich Village and Soho, graduate within four years, compared with just 61 percent of students in Bronx District 5, which includes Morris Heights, Fordham South and Mount Hope. 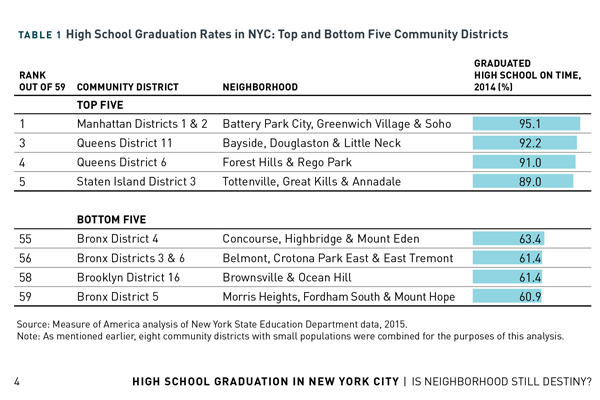 Disparities in New York City high school graduation rates by neighborhood dwarf those by race, ethnicity, and gender. Neighborhood disadvantage and the likelihood of not graduating high school in four years are strongly linked. 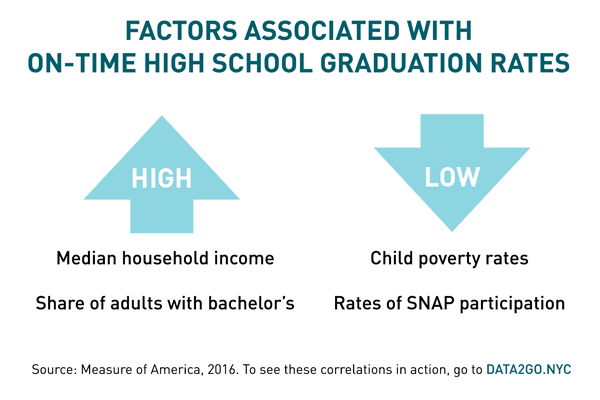 The higher the child poverty rate in a community district, the less likely a young person living in that district will graduate high school on time. The higher the median household income in a district, the higher the graduation rate of students who live there. A yawning chasm separates the on-time graduation rates of young people living in the City’s affluent, largely white neighborhoods and those who call low-income, black and Latino communities home. The City should set an ambitious, timebound target for slashing the neighborhood graduation gap and make the changes needed to get there. The city’s school choice program does provide benefits to some children. But it assumes all kids have adults in their lives with the time, language skills, social networks, and financial resources needed to help them through this bewildering process. Our analysis suggests this is not the case. As a start, middle schools need more guidance counselors with fewer student caseloads. And students need more good high school options to choose from. But in the longer term, this new analysis shows that we cannot expect the high school choice policy alone to overcome disadvantages years in the making. Real educational equality requires investments in children, families, and communities far earlier. For this, the city must address factors like economic insecurity, lack of safe, affordable housing, and the food insecurity and health challenges that high school students bring with them every morning they leave their home neighborhoods to travel to high school somewhere else. Data Tables (.xlsx), under "well-being"